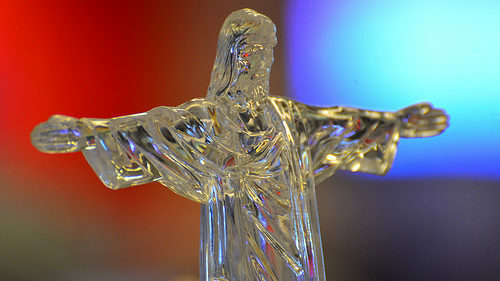 Local woman Sarah Plett has reluctantly held onto the tacky glass Jesus statue that her Uncle and Aunt brought back for her from a trip to Brazil they took in 1987. Plett claims she put the souvenir up on her dresser in the late 80s and has kept it with her ever since. Plett claims her distaste for the gaudy trinket is no indication of her spiritual condition, but worries that others might perceive it that way. Plett also has a huge collection of juvenile Bible study books, tracts, inspirational posters, and religious nicknacks on display in her home. Plett is currently seeking pastoral support for her terrible problem.